The goal here isn’t to keep you organized but to get rid of everything you don’t need and put what you do need right at your fingertips. Figure 1. This most basic Timeline panel setup is close to optimal, especially if space is tight; it leaves everything you need within a single click, such as Toggle Switches/Modes. No matter how big a monitor, every artist tends to want more space for the keyframes and layers themselves. Lower-left icons : Most (but not quite all) of the extra data you need is available via the three toggles found at the lower left of the Timeline panel. Layer switches and transfer controls are the most used; if you have plenty of horizontal space, leave them both on, but the F4 key has toggled them since the days when 1280 × 960 was an artist-sized display. Time Stretch toggles the space-hogging timing columns. The one thing I do with this huge set of controls is stretch time to either double speed or half speed (50% or 200% stretch, respectively), which I can do by context-clicking Time > Time Stretch. To rename an item in After Effects, highlight it and press Enter (Return) instead of clicking and hovering. Layer/Source (Alt or Opt key toggles): What’s in a name? Nothing until you customize it; clear labels and color (see Tip) boost your workflow. Parent: This one is often on when you don’t need it and hidden when you do ; use Ctrl+Shift+F4 (Cmd+Shift+F4) to show or hide it. I can’t see why you would disable AV Features/Keys; it takes effectively no space. The game is to preserve horizontal space for keyframe data by keeping only the relevant controls visible. To change the visibility (rather than the solo state) of selected layers, choose Layer > Switches > Hide Other Video. Solo layers make other layers that are not solo invisible. They allow you to temporarily isolate and examine a layer or set of layers, but you can also keep layers solo when rendering (whether you intend to or not). I prefer to use solo switches only for previewing, and often set the Solo Switches menu to All Off in my default Render Settings to ensure I don’t leave them activated by accident. It can make a heck of a lot of sense to lock (Ctrl+L/Cmd+L) layers that you don’t want “nudged” out of position, such as adjustment layers, track mattes, and background solids (but once they’re locked, you can’t adjust anything until you unlock them). If you’re a super-organized person, you can use layer locks effectively to check layers in and out, with the locked ones completed—for now. Shy layers are a fantastic shortcut in an often-cluttered Timeline panel. Layers set to Shy are hidden from the layer stack (once the Timeline panel’s own Shy toggle is enabled) but remain visible in the Composition viewer itself (Figure 2). Even if you keep the number of layers in a composition modest , a composition containing an imported 3D track from such software as SynthEyes or Boujou may arrive with hundreds of null layers. I tend to make these shy immediately, leaving only the camera and background plate ready for compositing. Figure 2. Shy layers can greatly reduce clutter in the Timeline panel, but if they ever trick you, study the Index numbers; if any fall out of sequence, there’s a hidden shy layer. Colors are automagically assigned to specific types of layers (like cameras, lights, and adjustment layers) according to Preferences > Label. I often apply unique colors to track matte layers so I remember not to move them. On someone else’s system, the colors may change according to local user preferences, although they will correspond overall. Comments are generally the least-used column in the Timeline panel, but that could change if more people start using a script called Zorro—The Layer Tagger by Lloyd Alvarez (http://aescripts.com/zorro-the-layer-tagger/). This script manages the process of adding tags to layers and using them to create selection sets. Layer and composition markers can hold visible comments. You can add a layer marker for a given point in time with the asterisk (*) key on your numeric keypad, meaning you can add them while looping up a RAM preview in real time. Composition markers are added using Shift and the numbers atop your keyboard or using the asterisk key with nothing selected. I sometimes double-click them to add short notes. Keyboard shortcuts are essential for working speedily and effortlessly in the Timeline panel. Home, End, PgUp, and PgDn correspond to moving to the first or last frame of the composition, one frame backward or one frame forward, respectively. Laptop users in particular may prefer Ctrl+Left Arrow or Right Arrow (Cmd+Left Arrow or Right Arrow) as an alternative to PgUp and PgDn. Shift+PgUp and Shift+PgDn skip ten frames backward or forward, respectively. Shift+Home and Shift+End navigate to the work area In and Out points respectively, and the B and N keys set these points at the current time. Don’t bother with punctuation when entering time values into a number field in After Effects. 1000 is ten seconds (10:00) when in Timecode mode. I and O keys navigate to the beginning and end frames of the layer. Press Alt+Shift+J (Opt+Shift+J) or click on the current time status at the upper left of the Timeline panel to navigate to a specific frame or timecode number. In this dialog, enter +47 to increment 47 frames or +–47 to decrement the same number; if you entered –47, that would navigate to a negative time position instead of offsetting by that number. We were reviewing film-outs of shots in progress from The Day After Tomorrow at the Orphanage when my shot began to loop; it looked out a window at stragglers making their way across a snow-covered plaza and featured a beautiful matte painting by Mike Pangrazio. About two-thirds of the way through the shot came a subtle but sudden shift. At some point, the shot had been lengthened, and a layer of noise and dirt I had included at approximately 3% transparency (for the window itself) had remained shorter in a subcomposition. Gotcha! The increment/decrement method, in which you can enter + 47 to increase a value by 47 or + -417 to reduce it by 417, operates in most number fields throughout After Effects (including Composition Settings). After Effects allows you to time the entrance and exit of layers in a way that would be excruciating in other compositing applications that lack the notion of a layer start or end. To avoid the accompanying gotcha where a layer or composition comes up short, it’s wise to make elements way longer than you ever expect you’ll need—overengineer in subcompositions and trim in the master composition. To add a layer beginning at a specific time, drag the element from the Project panel to the layer area of the Timeline panel; a second time indicator appears that moves with your cursor horizontally. This determines the layer’s start frame. 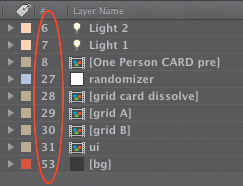 If other layers are present and visible, you can also place the layer in order by dragging it between them. Ctrl+/ (Cmd+/) adds a layer to the active composition. Ctrl+Alt+/ (Cmd+Opt+/) replaces the selected layer in a composition (as does Alt-dragging or Opt-dragging one element over another—note that this even works right in the Project panel and can be hugely useful). The keyboard shortcut Ctrl+/ (Cmd+/) adds selected items as the top layer(s) of the active composition. J and K navigate to the previous or next visible keyframe, layer marker, or work area start or end, respectively. Ctrl+Alt+B (Cmd+Opt+B) sets the work area to the length of any selected layers. To reset the work area to the length of the composition, double-click it. Numeric keypad numbers select layers with that number. Ctrl+Up Arrow (Cmd+Up Arrow) selects the next layer up; Down Arrow works the same way. To trim a composition’s duration to the current work area, choose Composition > Trim Comp to Work Area. Ctrl+] (Cmd+]) and Ctrl+[ (Cmd+[) move a layer up or down one level in the stack. Ctrl+Shift+] and Ctrl+Shift+[ move a layer to the top or bottom of the stack. Ctrl+D (Cmd+D) to duplicate any layer (or virtually any selected item). Ctrl+Shift+D (Cmd+Shift+D) splits a layer; the source ends and the duplicate continues from the current time. The bracket keys [ and ] move the In or Out points of selected layers to the current time. Add Alt (Opt) to set the current frame as the In or Out point, trimming the layer. For those who care, a preference controls whether split layers are created above or below the source layer (Preferences > General > Create Split Layers Above Original Layer). The double-ended arrow icon over the end of a trimmed layer lets you slide it, preserving the In and Out points while translating the timing and layer markers (but not keyframes). Alt+PgUp or Alt+PgDn (Opt+PgUp or Opt+PgDn) nudges a layer and its keyframes forward or backward in time. Alt+Home or Alt+End (Opt+Home or Opt+End) moves the layer’s In point to the beginning of the composition, or the Out point to the end. It can be annoying that the work area controls both preview and render frame ranges because the two are often used independent of one another. Dropping your work composition into a separate “Render Final” composition with the final work area set and locked avoids conflicts between working and final frame ranges and settings. The semicolon (;) key toggles all the way in and out on the Timeline panel: single frame to all frames. The slider at the bottom of the Timeline panel zooms in and out more selectively. The scroll wheel moves you up and down the layer stack. Shift-scroll moves left and right in a zoomed Timeline panel view. Alt-scroll (Opt-scroll) zooms dynamically in and out of the Timeline panel, remaining focused around the cursor location. Hold down the Shift key as you drag the current time indicator to snap the current time to composition or layer markers or visible keyframes. The backslash (\) key toggles between a Timeline panel and its Composition viewer, even if previously closed. The Comp Marker Bin contains markers you can drag out into the Timeline panel ruler. You can replace their sequential numbers with names. X scrolls the topmost selected layer to the top of the Timeline panel.